New Jersey’s metal elite are joining forces on August 22nd to play Rock Against Dystrophy’s benefit concert, “Rock Out to Knock Out Muscular Dystrophy”. The event will take place at New Jersey’s rock and metal haven Dingbatz in Clifton, New Jersey. This summer marks the third year of the benefit concert and its second with an All Star lineup. Tattoo Tony of Under My Skin Tattoo is returning for his third year as the event MC. Rock Against Dystrophy is a fundraising group that was started in 2009 by rock and metal internet radio DJs and brothers Jay Scorpion and Turbo, who have Spinal Muscular Atrophy (a neuromuscular disease under the category of Muscular Dystrophy), to bring awareness to the masses and fundraise for the Muscular Dystrophy Association. They unite the worlds of rock and metal together three times a year for benefit concerts in their effort to “Rock Out To Knock Out Muscular Dystrophy”. This summer marks Rock Against Dystrophy’s third year of benefit concerts in New Jersey and it’s second with an All-Star line up. This years New Jersey benefit will be taking place on Saturday, August 22nd at New Jersey’s rock and metal haven Dingbatz in Clifton, New Jersey. 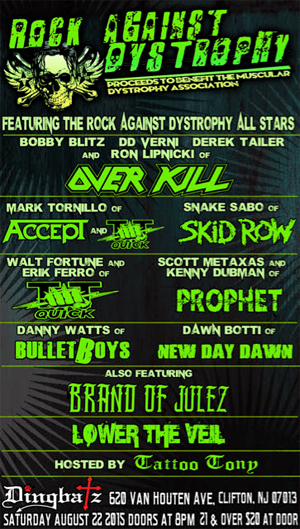 OVERKILL vocalist Bobby “Blitz” Ellsworth checked in about the benefit: "I'm happy to be working with R.A.D. and its founder Turbo. A good cause and a good night are coming to Dingbatz, with a lineup of Jersey's Metal-ists."